How long is the longest cigar in the world? The last record that I know of was made by Wallace Reyes of the Gonzalez Habano Cigar Company. In November 18, 2006, he rolled a 101feet cigar with a one inch diameter (64 ring gauge). 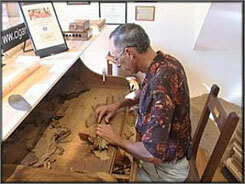 The record-making cigar was created during the annual Cigar Heritage Festival. “We gonna show Tampa and the world basically that this is still (the) cigar capital of the world, that we’re still making big things here,” Reyes said. A 180-foot cigar would shatter the old world record by more than 35-feet. Reyes says it will take him 30 pounds of tobacco and more than 100-hours of work to finish his cigar. He is making his record setting cigar in 10-foot sections at the Ybor City Museum and it will be assembled and displayed on November 21st at the Tampa Cigar Heritage Festival. Same person, same place, same festival. Would he break his record? Reyes says that they do not have the facilities to create the cigar all in one go. As such, he has to work on one segment at a time. The whole cigar will then be assembled in less than a month. All that work on one cigar! I bet that when he breaks the record, it will be all worth it!